I thought that was priceless, but I’m sure the doc found it strange. Medical people lead sheltered lives. They spend most of their time in white-walled clinics and emergency rooms. They don’t have deal with flies, cows, broncs, or ignorant dogs. In their world, everything is clean, everything works. Their patients do what they’re told, and most of them don’t bite or kick. There’s no way your average doctor can understand the things that happen to folks who work with horses and livestock every day. Example. The main joint of my right big toe was giving me fits. After I’d complained about it for two years, my wife got me an appointment with a foot doctor in Amarillo. He poked and pulled and twisted my toe, and scowled at the X-rays. Then he asked one of the dumbest questions I’d ever heard. “Did it help?” What does a toe doctor know about my life? It was hard to explain. My neighbor to the north always grazed his pastures down to the dirt, then the old sneak would let down the fence so that his scrawny, half-starved cows could slip into my pasture. He was always nice when I called and invited him to remove his cows, but he never did anything. I had to saddle a horse, drive them back home, and fix the fence. One sweltering day in June, I lost my Christian impulses and put his thieving cows through the fence at about twenty miles an hour…all but one calf, and he kept cutting back on me. I’d been looking for an excuse to practice my roping, so out came the twine. I needed practice more than I realized, and after catching dirt on several loops (you don’t need to know how many), I was in a real bad mood. Finally, I slopped one on, but as I was tying down the calf, he kicked me in the chest and tore my shirt. So I slugged him right between the eyes. I paid him five hundred bucks for a plaster cast and that gem of wisdom. I’d already heard it fifty times from friends and family, and they didn’t charge me a dime. A few years later, I made an unscheduled visit to the emergency room. I had a scratch over my right eye that was oozing blood, and while the doc was putting in thirteen stitches, he asked what happened. Well, a fellow gave me a yearling colt. 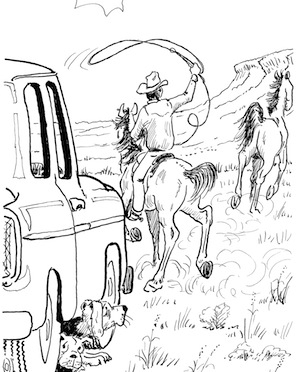 I’d thought the man was my friend, but the colt turned out to be a hellion mustang, and maybe there’s a reason why mustangs run wild and free. They don’t like people very much, and this one would not let me touch his ears. Articles are fine, but that’s not the way we do things around here. That colt was staying on my ranch and eating my grass, and those ears were mine. He just thought they belonged to him. I had no idea that a little snot of a colt could deliver a sucker punch so fast, but he did, and right in front of two of my children who were supposed to be getting a lesson on horse training. When I explained all this to the doc, he laughed and kept sewing. He didn’t belabor the obvious or offer any bonehead opinions. I was surprised. He seemed almost as sensible as a veterinarian. From now on, when I decide to do something stupid, I’m taking my business to him.